Livin and Lovin the Low Carb Life: My 30th birthday. Ok - so as I posted, I am turning 30 on August 29th. I HAD planned on inviting a bunch of friends out to go to Dave & Busters ON the 29th. I thought my fiance was going to be going fishing - as that's what he said his plans were for the day. So I'm driving home from the movie and texting my fiance, telling him how great the movie was - and he asked me to park in front of the house, instead of on the side in the driveway, like I normally do. So I did - whatever - didn't even think about it...walk in and SURPRISE!!!!!! He threw me a surprise birthday party! All of my friends and my parents were there. It was AWESOME! Now, I had already planned that ON my birthday I was not going to care about low-carb and enjoy myself with foods I normally wouldn't eat. So - since this was my birthday, I enjoyed myself immensly on saturday. 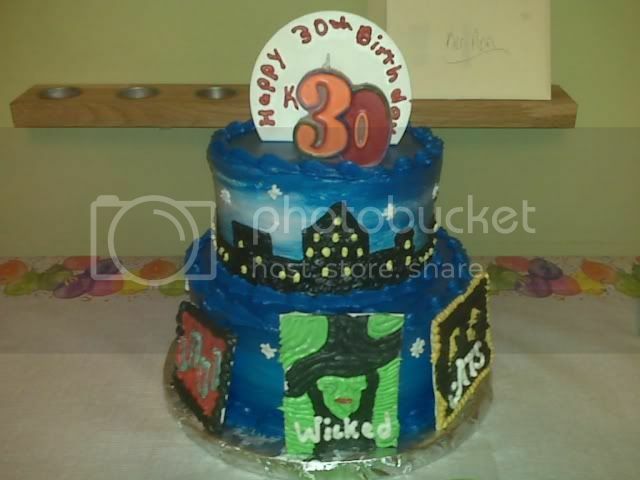 They got me an INCREDIBLE cake - "Rent", "Wicked" and "Cats" on it. And it was my FAVORITE - red velvet. It was great - I had an incredible time. 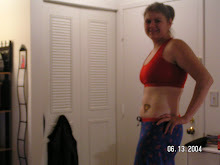 This morning (Tuesday) I'm still up those 4 - so I am putting that as my weight right now. Seriously though - I know that I can NEVER go back to the way I used to eat. I enjoy my new lifestyle WAY too much. so yeah - that is my "confession". No one is perfect (although I'm damn close! lol) I enjoyed my birthday and I am now back to my regularly scheduled program!